Product code: 19930 Category: Bags. Rich Columbian leather coupled with the exquisite design of this bag is the perfect way to show fashionistas how much you appreciate them! The Soledad makes a great gift for high-performing employees or VIP clients. It features perforated accent, a front zippered pocket for quick access, inside organizer and zippered pocket, adjustable leather carry handles, extended leather pull zips, and an adjustable and removable padded tangle-free shoulder strap. Size Choose an option20.75 in. x 11.75 in. x 9.75 in. Setup Charges :$80.00 per location. Pricing includes debossing on one location* May vary according to product availability from supplier. ** Price subject to change without notice. 20.75 in. x 11.75 in. x 9.75 in. 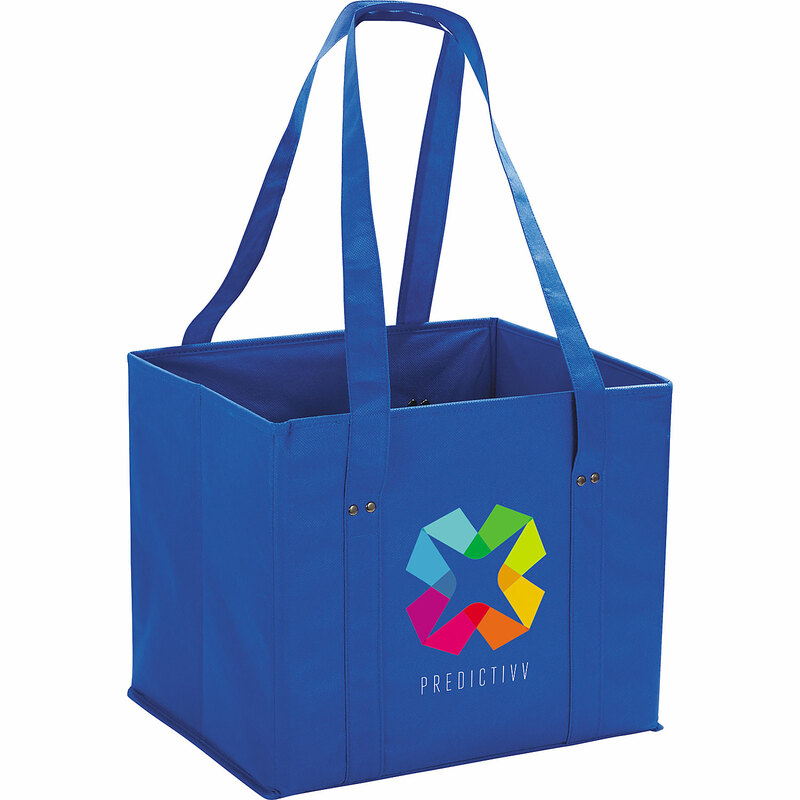 This tote is perfect for everyday use. 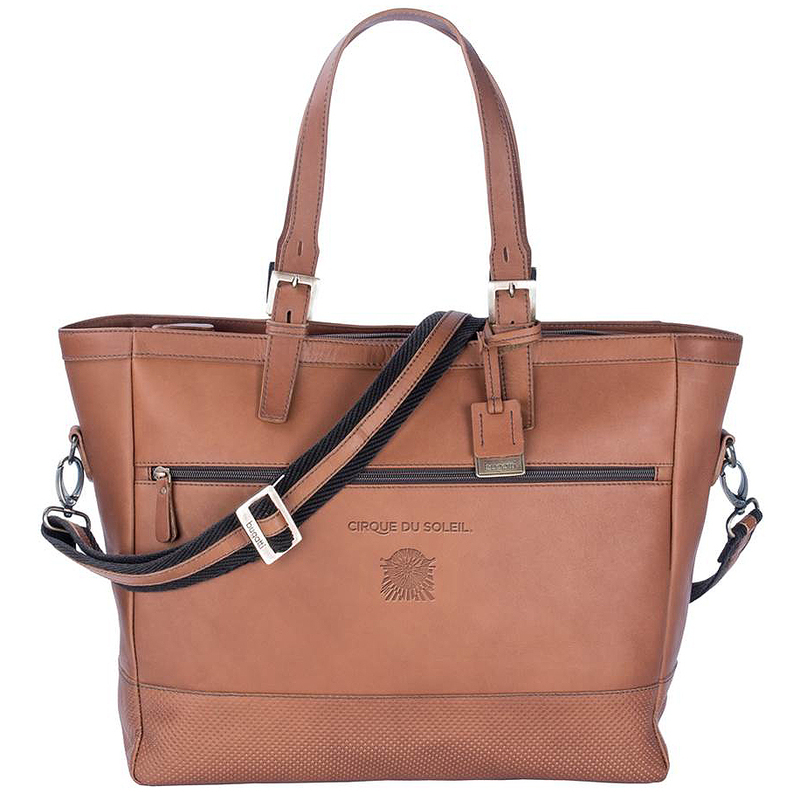 With an open main compartment this tote features a dye cut patter on the side panels. 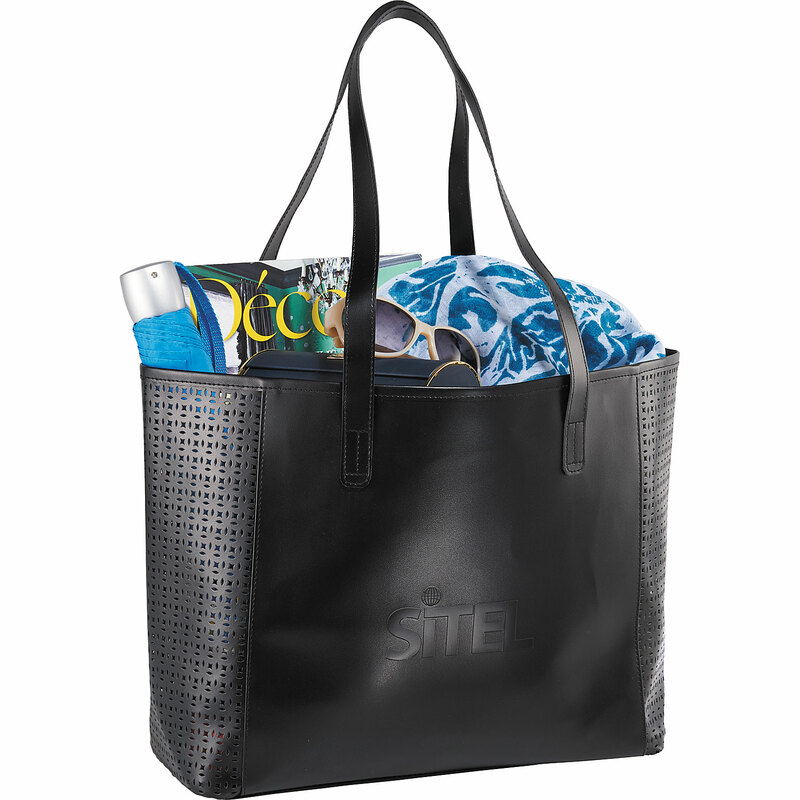 The tote includes double 11.5 in. handles. 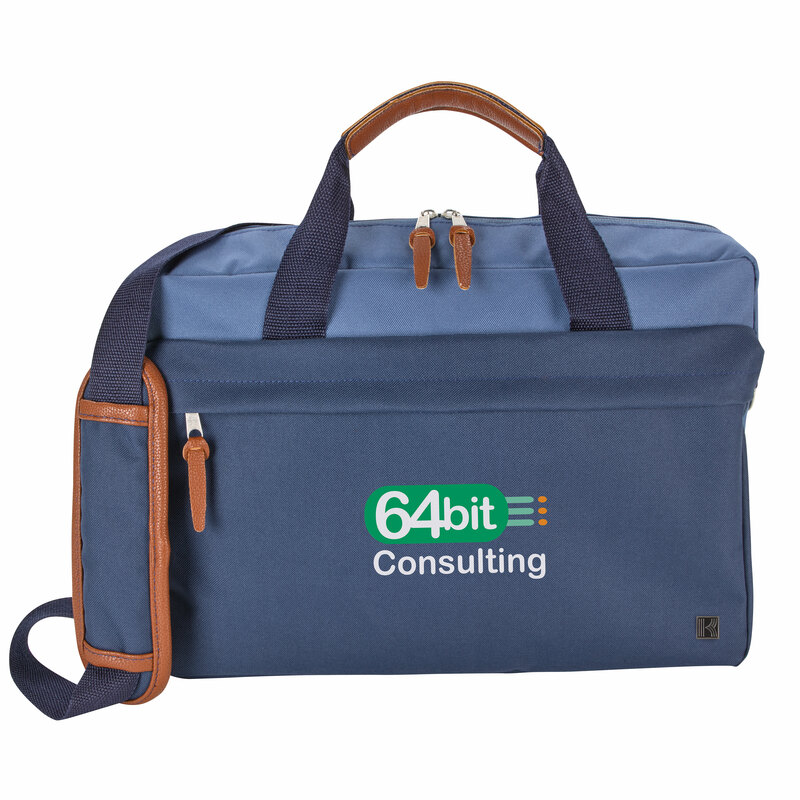 This computer tote is perfect for anyone to use on the daily commute to work or as an everyday cross body bag. 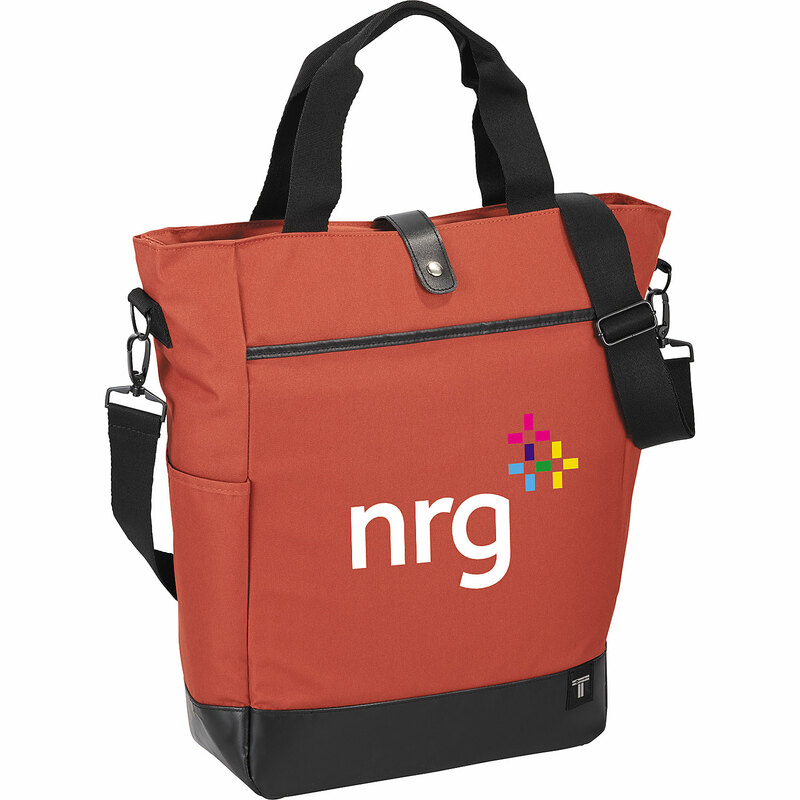 The tote features a front slash pocket with a Velco® closure to add extra security and a zippered main compartment with a vinyl snap closure that can hold up to a 15 in. laptop or be used as a tablet sleeve. It also includes extra pockets on both side gussets for additional organization, an adjustable, removable should strap and 6 in. grab handles. 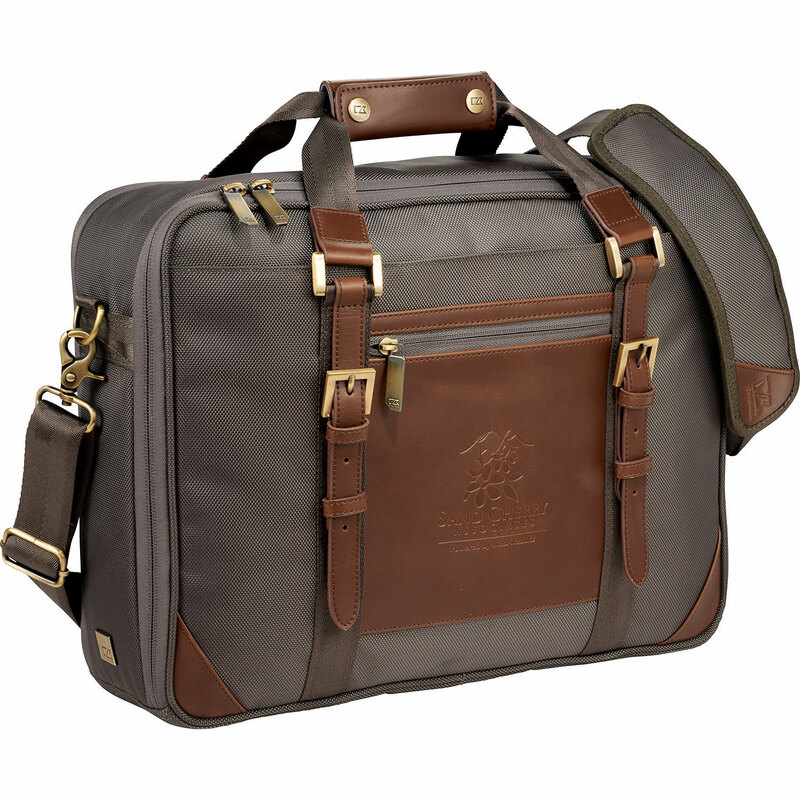 Made of rugged materials like 1680d ballistic polyester, this compu-briefcase is mixed with rich genuine leather and premium antique brass hardware. The functional details make this a bag that looks good, and never disappoints. The rear dedicated laptop compartment has room for your 15.6 inch computer and the main compartment has a dedicated spot for your iPad or tablet. The interior includes mesh pocket for your cables and accessories, as well as space for your files, padfolio, books, or anything else you need on your daily commute or trip. The front organizer has space for pens, phone, powerbank, cards, or keys. The removable adjustable shoulder strap allows you to carry it over the shoulder, or with the leather accented handles. Also features a zippered pocket on the back for quick-access that doubles as a trolley sleeve, and custom high-quality lining that gives a premium feel inside and out. 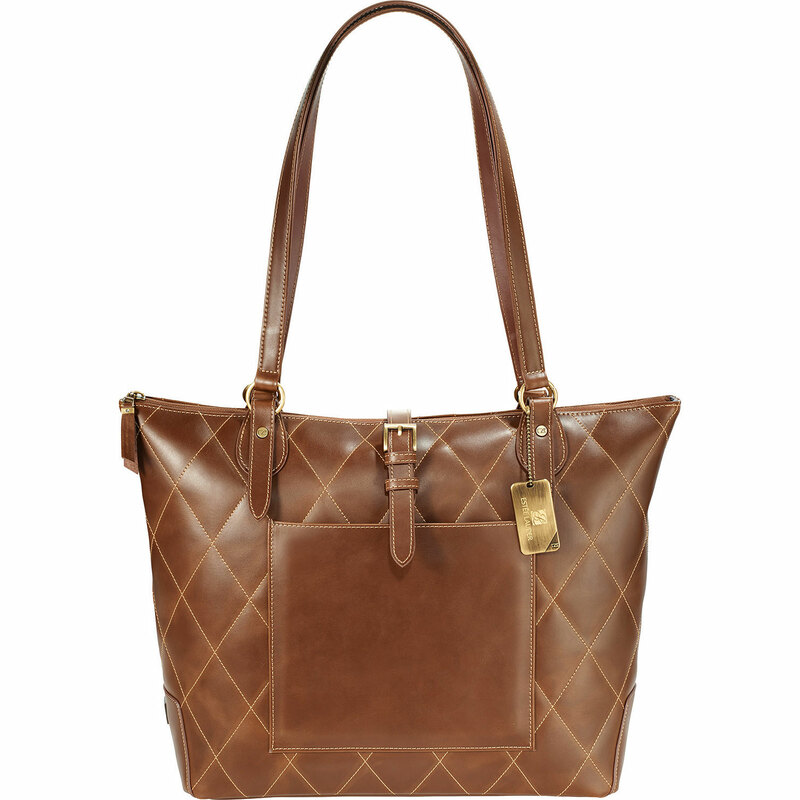 The CutterBuck® quilted tote is rich in contrasts! This leather bag is by far one of the most luxurious totes around. The zippered main compartment is accented with a leather flap snap closure for extra security and style, and the open main compartment has a dedicated and padded 15 inch laptop sleeve as well as a padded tablet sleeve. A large zippered compartment is offered as well for added security and organization, and a front slash pocket is the perfect spot for your phone for easy access. Detailed with signature CB rivets found at the base of the 14 inch leather handles which compliment the quilting of the leather across the body. This tote is perfect to run errands with. It is made from 100g non-woven material and has a supportive board reinforced on all sides and includes a sewn in bottom board. It has 12.5 in. grab handles and can fold completely flat for easy storage. Make sure you have all of your devices and belongings with you for your next meeting! The 600d polyester briefcase features a main zippered compartment, interior padded laptop sleeve, front zippered pocket, and PU leather accents. 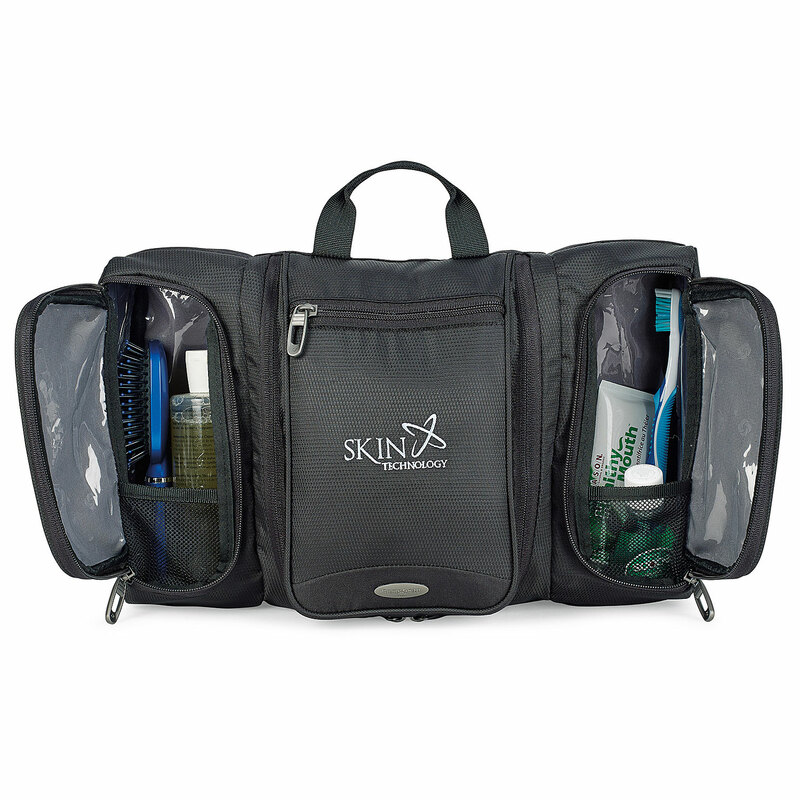 This Samsonite arden amenity case is the perfect gift to give those who are traveling this holiday season. This 420d dobby amenity case features a main compartment with zippered and mesh pockets for storing and organizing toiletries, dual front door opening zippered pockets with wipe clean interiors and a top grab handle for portability. There is also a removable hanging hook for convenience while you are away and it lies flat when packed to allow for easy packing and more room in your suitcase. Heading to the gym for a last minute workout? 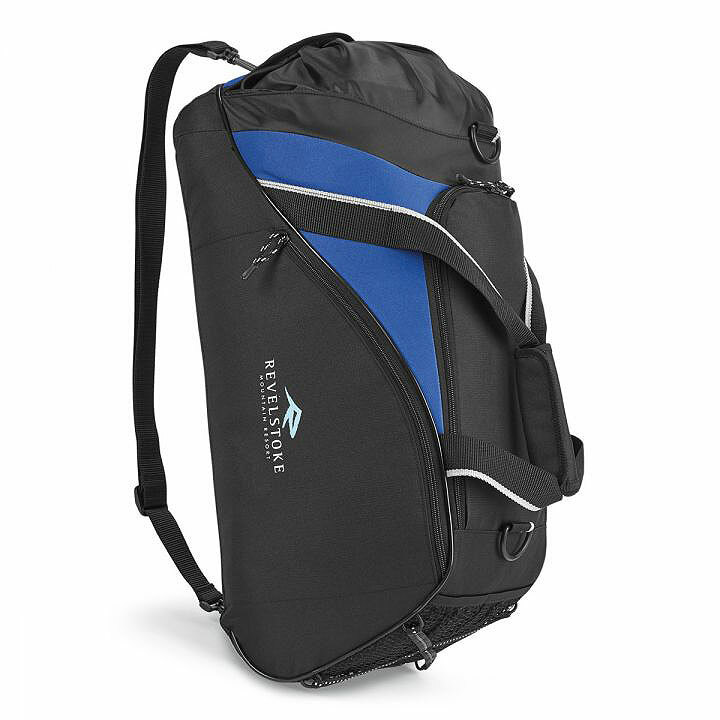 The fast break sport bag has all the space you need for your gear. Made from 600d polyester/420d ripstop, the bag features and end shoe tunnel with cinch closure, convertable adjustable shoulder strap that allows you to use it as a duffel or sling bag, dual water bottle pocket with bungee strap accents for additional storage, zippered u-shaped opening, zippered front pocket, and padded handle wrap. This simple snap tote is anything but ordinary! 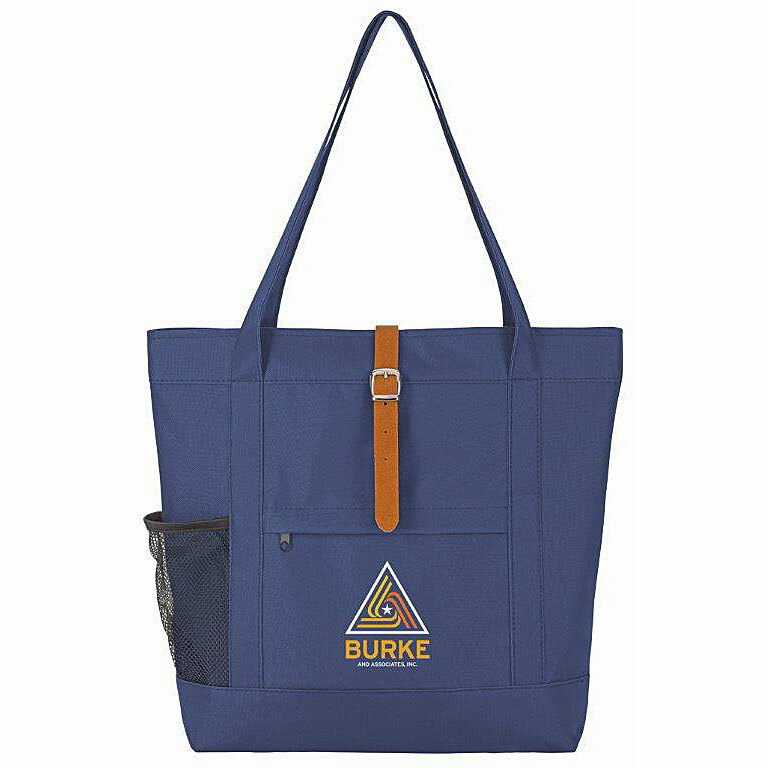 The 600d polyester tote features a large main compartment with a trendy PU leather snap closure, front zippered pocket, and side mesh pocket. 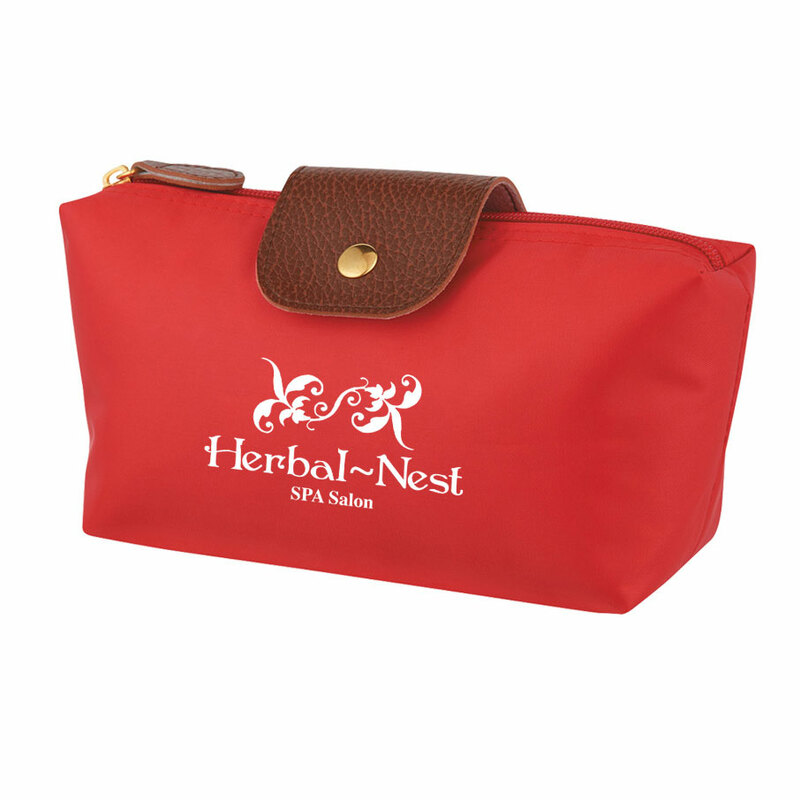 This cosmetic vanity bag is the perfect accessory for the busy bodies among us. Featuring a zippered main compartment and made of 230D polyester it is the perfect size to take throughout a busy day or when travelling.